International Earth Day is just around the corner. Just the perfect occasion to know what we, as responsible citizens, can do to mitigate the global e-waste issue. Because, believe it or not, e-waste, just like every other social and economic issue, begin from us. And only we have the power to control it. The generic answer for e-waste seems simple – buy less, and be responsible for all the electronic equipment you buy. However, oftentimes, buying more is not a nuisance. But a necessity. The best example here would be organizations working with telecom equipment. Or any IT company, for that matter. With the introduction of cloud computing and wireless technology, traditional telecom devices are slowly dying. Companies running on them have no choice other than letting their obsolete telecom equipment collect dust in the basement or sell them all together. Looking at the global e-waste meter and the speed with which technology is progressing, the rise in e-waste is set to be a major for a long time. Luckily, awareness on e-waste recycling is growing as we speak. Initiatives like Earth Day, even E-waste day – first introduced on 13 October 2018 – is a great way to bring the issue in front of larger masses. There is still a long way to go, we understand that. 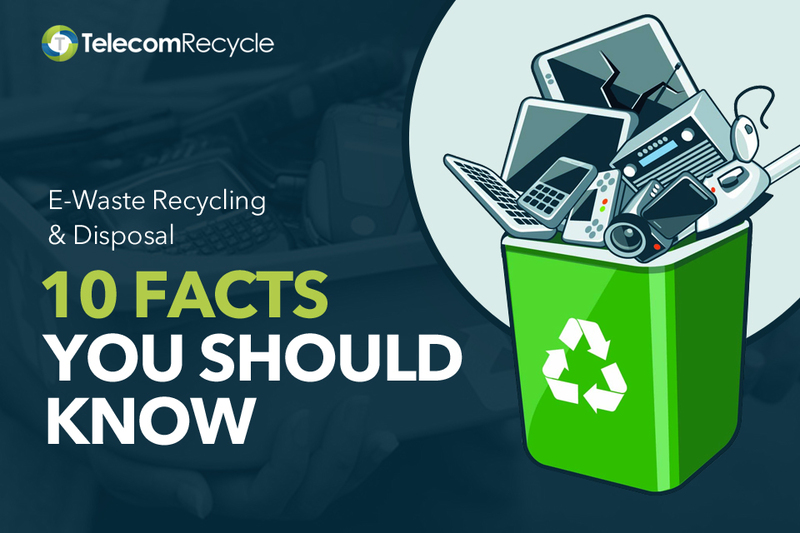 That’s why we have compiled 10 interesting facts about e-waste and e-waste recycling so you know where we are standing. Globally, we have surpassed the 50 million metric tons of e-waste mark last year. Majority of these numbers come from small equipment – wires, cords, small phones and more. Additionally, leaders from the United Nations expect the production of Waste Electrical and Electronic Equipment (WEEE) to go up by 500% over the next decade. Scary. Other than the zeal to get the latest on the market, there are several other reasons contributing to e-waste. This list includes growth in cloud computing services (as we mentioned earlier), a rise in data centers, a reduced shelf life of equipment among the others. E-waste per inhabitant comes up to 6.1 kilograms (kg/inh) annually, as per a 2016 report. An amount equal to 4,500 Eiffel Towers, as accounts humorously put. This number is expected to grow to up to 6.8 kg/inh, by 2021. Of all the 50 metric tonnes, only 20% is documented to be collected for recycling. The fate of the rest is divided – a significant amount is shipped to unfortunate third-world countries for some quick bucks. Remaining e-waste is either dumped into landfills or incinerated illegally. Asia is documented to be the region generated the highest amount of e-waste followed by Europe, the Americas, Africa, and Oceania. A large part of the e-waste there can be traced back to the Americas via illegal trading or dumping. The United Nations estimates between 10% and 50% of US e-waste is exported to regions in Asia and Africa. By far only 41 countries have official e-waste statistics. The stats for the rest is just an estimation – it can be far larger than it seems. Hazardous materials make up 70% of the 20% recycled e-waste. When dumped into landfills, these materials can irreversibly affect the water resources. Burning them can pollute the air too. Electronic gadgets contain toxic substances like lead (may contribute to cancer, cadmium, and mercury. Dumping e-waste illegally also vouch for a huge loss of precious raw materials. The total value of all raw materials present in e-waste is estimated at approximately $62 Billion in 2016 – that is more than the 2016 Gross Domestic Product of most countries in the world. Precious metals like gold, silver, and copper can be found in electronics. E-waste recycling can help us recover most of it. In fact, Ask Apple re-captured around 2,204 pounds of gold that is worth $40 million from recycled devices in 2015. If you’ve already thought of selling your obsolete and surplus telecom equipment, kudos to you! If not, I’m sure these facts will help you make a decision now! Looking for an R2 certified e-waste recycling partner? Your search ends here. Contact Telecom Recycle today!